Originally, South-West Climbs, published in 1979 by Diadem, was a single-volume publication and was a collaboration between one of the South West's most prolific and important activists, Pat Littlejohn, and one of the most influential of British Publishers, Ken Wilson. This rapidly became very popular and introduced many climbers to the joys and pleasures of the sometimes mysterious and occasionally remote south-west peninsula of England. 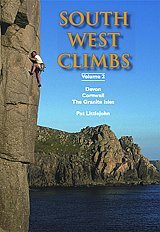 For this new and fully revised edition, the climbs of the South West have been split into two volumes. The second volume has now been published and covers the Granite of West Penwith, Dartmoor, the Channel Islands and Lundy - the guide also covers the North Cornish and North Devon coasts. Written by Pat Littlejohn with 'a little help from his friends' this new guide describes some of the most adventurous climbing to be found in the British Isles and together with its counterpart, South West Climbs: Volume 1 provides the visiting climber to the area a wealth of top-quality routes to go at.